Alpha Station is Windows Application used to communicate and configure the vast majority of NCD devices offered within the “Enterprise Solutions” category of our web site at ncd.io. Alpha Station is the successor to Base Station, which is used to test and configure older NCD devices. Base Station is now finalized, and no further changes or enhancements will be made. All future work will be focused on Alpha Station. Base Station will still be required by older devices. Alpha Station will be required for all newer devices. Like Base Station, Alpha Station contains many forms for many different controller types, including our Enterprise IoT Long Range Wireless Sensors. Alpha Station also includes a full suite of test and configuration software for our ProXR Enterprise line of controllers (under development). Alpha Station gives our developers a clean slate, which was needed after 6 years of adding code to Base Station. Since Alpha Station covers so many products, the project forms are always subject to updates. Here we will focus on how to use Alpha Station with each class of controller, but keep in mind, these forms will be updated over time and photos shown below may age rather quickly as we are adding new features to Alpha Station all the time. The latest version of Alpha Station may be downloaded from https://ncd.io/alpha. Alpha Station was developed using Visual Studio Community Edition (a Free Download from Microsoft). We used a Windows 10 computer with modern updates during development. We have tested with Windows 7, though there were a few minor layout/display problems, the software generally worked well and should be compatible with Windows 7 or later computers. Alpha Station is relatively light weight, making it a quick and easy install without too many dependencies. Visual Studio 2017 Source Code is included in the download archive. We strongly advise poking around at the source code if you have time. We have encapsulated most hardware functions within a library call, making implementation much faster. You can build a UI and call our libraries for just about everything, so making your own interface is very easy. Feel free to alter, improve, change or modify Alpha Station as needed. You may include all or portions of our software in your own commercial software if you want without disclosure. It’s a “do whatever you want” license. This license is not extended to the use of NCD registered trademark logos (included in Alpha Station). A. Select COM Port if you are working with a USB Modem or Gateway. This options is also compatible with any other COM device we may release in the future, including RS-485, Bluetooth, RS-232, etc. B. If you choose the COM Option, you will need to select a COM Port and Baud Rate. Port Options will depend on the devices that are properly registered with your computer. The default baud rate for NCD Enterprise devices is 115.2K Baud, but some devices may support 9600 Baud. If you are unsure, try 115.2K Baud first, then try 9600 Baud. C. The Network option is for devices that are connected to Alpha Station using Ethernet or WiFi communications. You will need to know the IP Address. NCD devices will broadcast their IP address to Alpha Station and will be listed in section E. Leave the High-Speed Ethernet option enabled. D. The IP address must be entered into this box. You may change to any IPV4 address supported by the NCD device. The Listen Port should be 2101 by default. 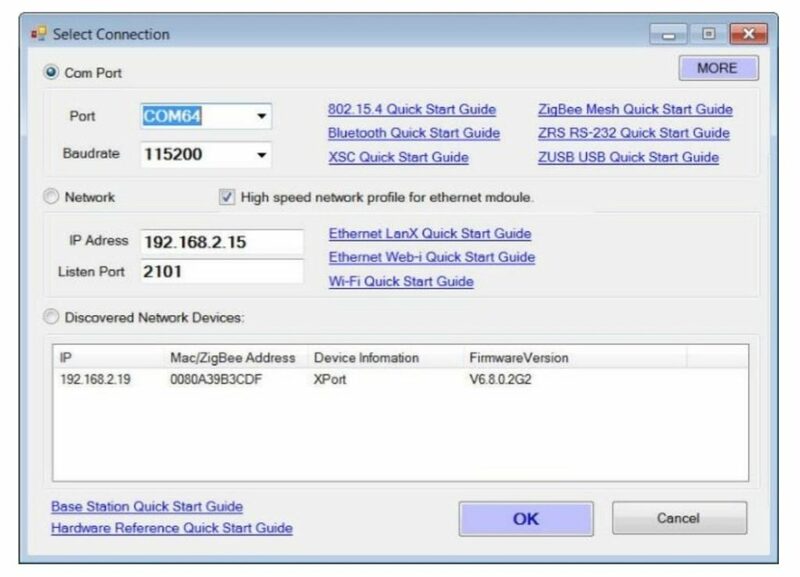 Most NCD devices will allow you to customize the IP address and Port number. E. The Discovery Box will display any Ethernet or WiFi devices that are discovered by Alpha Station. The Discovery Box is always listening in the background for a compatible connection. Wait for a device to appear in section E, be sure to click the C radio button. Then double-click on the discovered Ethernet or Wifi Modem. This will establish a connection to your Ethernet or WiFi modem. Follow the directions shown below to view incoming sensor data. F. Wireless Destination is a new box that we have added. This will allow Alpha Station to target communications to a particular wireless device using the devices unique wireless network ID. This box was created specifically for communication to our upcoming line of Wireless I2C devices. G. Enter the Network ID of the wireless device you would like to target using the HEX values shown above. The top 4 HEX values should never change, but we have allowed the option just in case. The Network ID is printed on the compatible Wireless device. H. The “Default Address Settings” fills in the boxes with an example valid address. This does not indicate it will work with your device, but it will get you close if values were accidentally changed. I. Click “OK” to begin communications between Alpha Station and your remote device. Click “Cancel” if you would like to Exit Alpha Station. Alpha Station will try to identify a device and provide you with relevant control panels that apply to your device. If communications fails, Alpha Station will assume you are trying to communicate with NCD Wireless Sensors and will provide you with the option to enter the Sensor Viewer. When working with NCD Wireless Sensors, a device identifier will not be available as shown in Section A. The “Sensor View & Setup” option will be displayed in Section B. Click this option to enter the Wireless Sensor Discovery and Configuration control panels. Section C provides quick external links to the latest version of Alpha Station, as well as links to this document. You can see a complete compatibility list of Alpha Station hardware by clicking the “Buy Devices Compatible with Alpha Station” button. A. All Sensors that are broadcasting will slowly appear in the list above as data is received and parced by Alpha Station. The Address column is the most important data about each sensor, as this is a true unique ID that can never be changed or emulated. The purpose of these rows is to show a human readable summary of all incoming sensor data. Section A will continue to grow until all available sensors are listed. B. This section displays the “Complete Payload” which is the complete data elements generated by our sensor. Each sensor type will have a different structure for the Complete Payload field. The “Sensor Payload” shows ONLY the sensor data, excluding data the common data structure of all sensors. For instance, the Sensor Payload may contain temperature and humidity data ONLY, but common elements such as Node ID, battery level, sensor type, counter, and other common fields are excluded in this field. The “Sensor Readings” field will show a human readable summary interpretation of the data. The summary data is provided for easy prototyping and development, it is not intended to be actually used or logged. Each sensor parameter may be extracted using our Library in a common way, so we never advise trying to parse the Sensor Readings string that is generated by our software. C. The modem configuration is critical to successful communications with all sensors in the area. The default Pan ID (Personal Area Network Identification) is 7FFF. This is common to every sensor as shipped from NCD. Large networks of sensors may benefit from clustering sensors into a few different networks so they become more manageable, but this is a topic for large installs. Don’t change the Pan ID of the sensor or the modem unless advised by NCD technical support. Note that changing the Pan ID will clear the list of discovered sensors. NOTICE: If Pan ID 7BCD is shown, Click the “Use Default Pan ID” Button and then click “Write Modem Settings”. Please note that Pan ID 7BCD is reserved for configuring wireless sensors, and should NOT be used for sensor monitoring. D. This section lets you store and read modem settings. We do not advise changing setting unless advised by NCD technical support. E. The View and Setup buttons are used to view more details about each sensor or to reconfigure a sensor with different parameters. These topics will be discussed in detail later. F. The Console options allow you to clear the list or switch to Big Window mode, which may be helpful when working with large groups of sensors. Sensor Data is broken into three groups. Section A displays data common to all sensor types. Each data element shown in Section A is provided by a variable in our library. This makes parsing of sensor data very easy. For instance, there is a string variable for Info, a string variable for Address, and a string variable for Summary. Similarly, there is a decimal value for battery level, an integer for Transmission Cycle Counter, Sensor Type, Firmware Version, and NodeID. The Transmission Cycle Counter a number that constantly counts from 0 to 255 in an endless cycle. Every transmission increases the counter. This can be used to help you identify missing packets. The Sensor Type is a unique identifier used to indicate the type of sensor. This particular control panel shows a Vibration Sensor, but other types of sensor may include different types of data, and therefor a different control panel is available for each type of sensor. The firmware version indicates the version of firmware installed in the sensor. This is a value from 0 to 255. 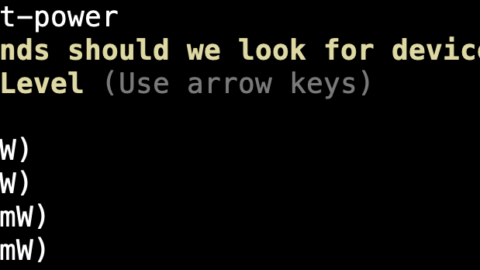 The Node ID is completely optional. 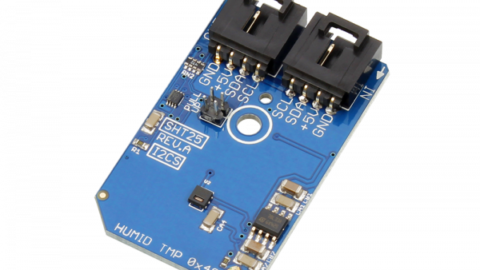 It helps users identify the sensor, with a simplified number instead of the long address variable. 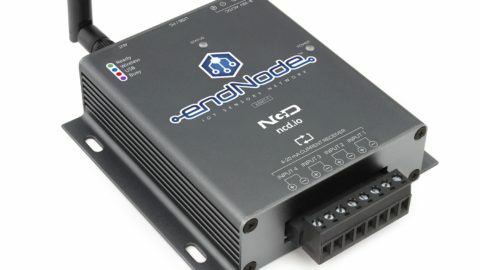 We suggest using the serial number as much as possible, but the Node ID can help you identify sensors more quickly. You may use Node ID for anything you want. This value is a number from 0 to 255 and is programmable for each sensor; unlike the serial number of each sensor, which is a unique value that cannot be copied. Section B contains data unique to the sensor type. For instance, Sensor Type 8 is a Vibration Sensor, so section B displays each individual variable available for Type 8 sensors. Section C displays raw data from the specified sensor. The Complete Frame is the entire package of data received from the sensor. 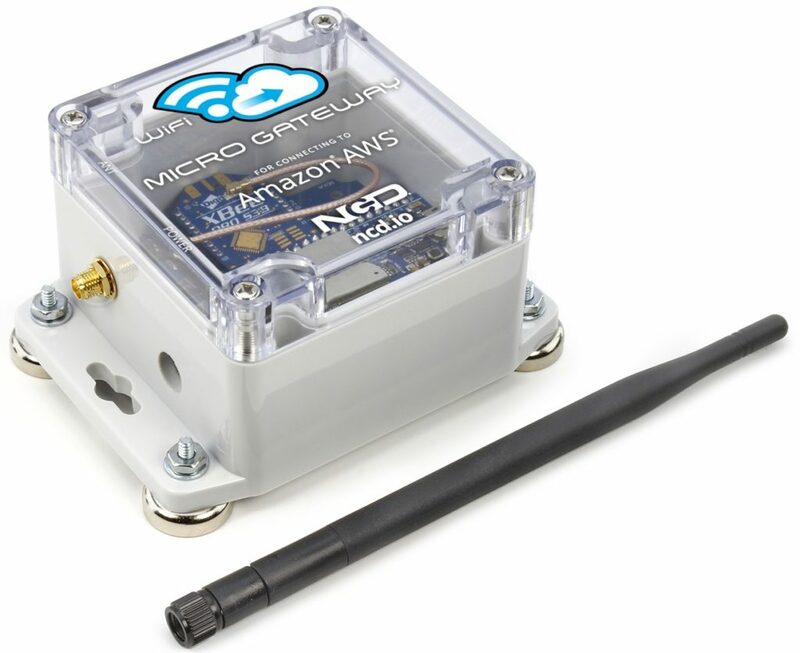 The Complete payload is the Data ONLY portion of the sensor (it does not contain the headers, serial number, or other package data that is common to the wireless protocol. Sensor Payload contains the sensor data ONLY (everything shown in Section B). It does not contain any Section A data. Click the “Setup” button to begin the configuration process of the selected sensor. It’s important to follow the instructions provided exactly. Section A above shows the configuration control panel waiting for a sensor to enter configuration mode. Simply press and release the Reset button on the sensor, then hold the Configuration button down on the sensor for 6 Seconds. When the software receives a Configuration mode message from the sensor, the window will change. If the software does not respond the first time, try again. The Alpha Station will wait on this screen until a configuration message is received. It’s very important to choose the correct sensor. You cannot configure just any sensor when this panel is opened, you must select the corresponding sensor with a matching serial number as shown in the background image. Choosing the wrong sensor for configuration will display the message shown above. This occurs when you click “Setup” for one sensor, but put the incorrect sensor in Configuration mode. If this occurs, you MUST press the “Reset” button on the incorrect sensor. Failing to reset the Incorrect sensor will leave the sensor in Configuration mode, and will drain the batteries in a short period of time. When the Sensor Configuration control panel opens, it automatically attempts to read settings from the remote sensor. As settings are fulled from the remote device, the control panel will populate with sensor options as shown above. If for some reason the control panel does not display all settings shown above, you may need to click the “Read Sensor Configuration” button (Section A). Note the settings shown above are typical of a wireless sensor. If settings look unusual or are inconsistent with known settings, the program may crash. In this case, make sure only ONE sensor is in configuration mode. Having multiple sensors in configuration mode is known to cause problems. If all goes well, the control panel will fully populate as shown above. Below is an explanation of each setting. B. Set the Personal Area Network ID using this setting. The Pan ID is very important, and may be used to group sensors together. For instance, the upper floor of a building may need to be on one Pan ID while the lower floor of a building is on another Pan ID. This will essentially put all sensors in two virtual networks. This makes managing lots of sensors much easier. Please note than Pan ID 0 and 7BCD are reserved. This control panel will not allow these two Pan ID to be configured in your wireless sensor. C. Set the Number of Retries. This is a very important setting, as it defines how many times a sensor will attempt to transmit to a gateway or modem before going to sleep. NCD Wireless Sensors will validate the completion of a message up to 10 times before sleeping. Set this number to a lower value to extend battery life at the cost of potentially lost data. D. Delay in Seconds between transmissions. The delay value will determine how often NCD sensors wake up and send data. Many NCD sensors equipped with 2 AA batteries are rated for around 500,000 transmissions. Therefore, a delay of 600 seconds means the controller will wake every 10 minutes, allowing the sensor a lifespan of about 300,000,000 seconds (About 9.5 Years). This can help predict battery life, as this setting will directly determine longevity. E. Node ID is a user-configured Identifier that may be used to help determine which device you are working with. Users typically program a unique ID number, but this value has no functional purpose, and may be used for anything you prefer. F. Power Level is a value from 1 through 4. This setting will directly impact range. While it may seem desirable to leave this setting at the maximum value, we urge customers to use this setting judiciously. By reducing the transmission power, two benefits are gained: Battery Life is Lengthened and Interference between other sensors in the area is reduced. We have seen cases where lowering the transmission power has reduced interference significantly. Be sure to take advantage of this setting for best results. G. By default, sensors are in Broadcast mode, meaning multiple modems can receive sensor data. 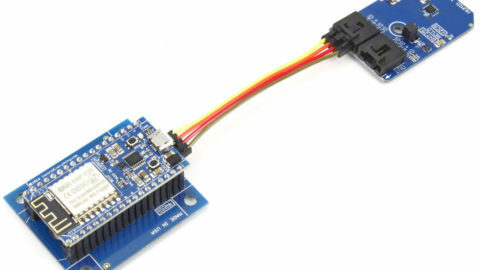 This means any combination of USB modems, Ethernet Gateways, and Node-Red installations can all receive and evaluate sensor data simultaneously. We strongly recommend leaving controllers in Broadcast mode and using the Pan ID setting to change wireless networks. However, if you only plan to send data to a particular modem, this value can be changed. All wireless transmissions will be focused to a specific destination. Please note that any malfunction of the modem will require you to factory reset the sensor and target a new modem. Absolute destination targeting is not advised, but is offered if necessary. 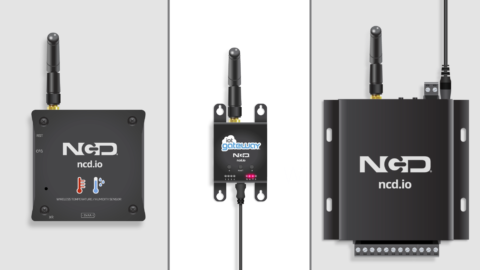 H. NCD Wireless Senors use 128-Bit AES Encryption to secure wireless sensor data. Modems and sensors must have the same encryption key for a broadcast to be received. If you would like to store a unique encryption key in the sensor, you may enter a 32 Digit Hex value in the Encryption key box. We advise leaving this box untouched unless you need to change the Encryption key. When sensor settings are stored, a new encryption key will be stored with the settings, but only if the Encryption box has changed. If you do not enter any new values into the Encryption box, all settings will be stored EXCEPT the Encryption key. Put simply, if you change the Encryption key, the new key will be stored. If you leave the Encryption box alone, the key will not be altered. Changing to an incorrect encryption key may require a sensor to be factory reset. I. Store you settings once you have made the desired changes. J. This box provides helpful information as you work through this user interface. Watch this box for important messages, updates, and helpful information. All Sensor Data will be Wiped and the sensor will return back to Factory Encryption and Pan ID settings. ProXR Enterprise controllers contain complete identification information as shown in Section A, including associated circuit boards and firmware version data. Section B will show all the related control panels with the device that was discovered. Section C is exactly as shown in the previous illustration.